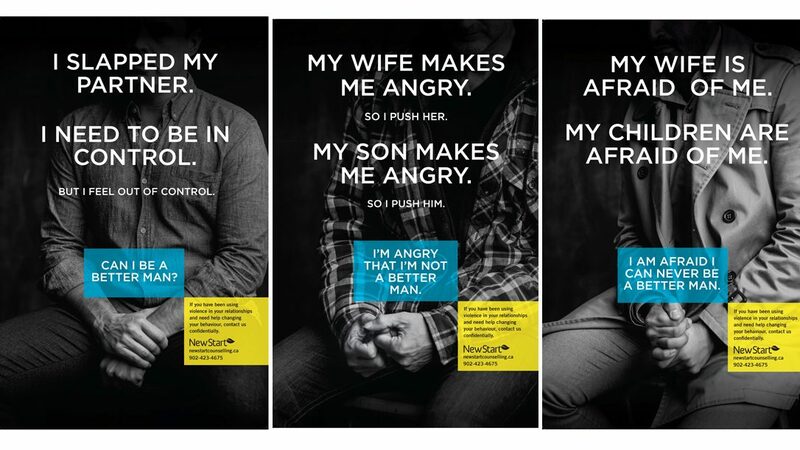 New Start Counselling (Halifax, Nova Scotia Canada) has recently launched a campaign utilizing comments made by abusive men who have used their services. and “My wife is afraid of me. My children are afraid of me”. “We wanted to be as authentic as possible and use the words that men use,” the executive director of New Start, Wendy Keen, told a news conference at police headquarters on Tuesday. New start was founded in the 1970’s in halifax and works with local transition homes where women and children have had to flee to when their husbands\partners are abusive. New start then provides the men with an opportunity to work on their issues. New Start is a registered Canadian Charity, but does state that they take a fee for their services. Their website also states that no one is turned away if they can’t afford their services. They are funded both through private donations and through the Halifax department of services through an operating grant. The advertisements have gone viral and it’s pretty obvious why. They are extremely controversial. Behind every one of these three statements was a man who abused his wife or children. They used violence against someone innocent. While I commend a man who seeks help when needed I can’t help but think that government money should be better aimed at correcting this problem before it begins. Target our youth, stay focused on justifying why violence is never an option. We need to teach not only young men, but young people in general that violence is never the answer. That strength can be just as equivalently proven through peace. That often in life it takes more strength to walk away peacefully than to turn around and fire back. Those who abuse innocent victims, particularly children need to pay severe consequences. Yes, help and support is a much needed service, but quite often it is much too late for the innocent victims of these crimes to recover.